I am about to install support for a full length dormer, this will be a RSJ. On architects plans RSJ goes into chimney breast, I seem to remember this unexceptable practice with solution being, RSJ into party wall opposing end supported via a stud partition. Would very much appreciate some clarity. I am thinking of boarding out my loft space (storage only). Would it be wise to board on top of these? I would have to add extra 4x2 so the loft boards would span the area. This would then create a gap between joists and new floor. I'm doing my investigation to put down some loft flooring. All the loft board packs that i have seen, mainly B&Q and Homebase, require the joist centre span to be no more than 450mm wide. My joist centre spans are around 560mm. Can you suggest what i should do in this case? My existing joists are 5"x1", would they need some extra strengthening? I was wondering can you join to steel beams (with bolts) to form a long beam.. your help and advice is require. I own a 1969 built house my roof space as been abandoned for some years I have eventually got round to a conversion of sorts. My problem is roof trusses in the centre of the roof space but only there can I safely remove these to create more space. Good evening, I am in the deciding process as to if to do a loft conversion. I have the purlin & rafters design as our house was built in 1946. It is a semi-detached. My question is, all the framework below the purlin (which consists of four 4x2 struts and two 3x2 horizontal joists) would be in the way of any conversion. Would it be possible to remove! or move them as to gain more floor space?. Could the 4x2 pieces be made vertical, so that the purlin is supported vertically to the floor beams rather than at a angle?. I have attached a photo to hopefully show it more clearly. I am renovating a old terraced house and have put in a RSJ to open up the 2 rooms downstairs, i have replaced the old joists with new 7" x 2" joists and new 8 x 2 floor boards laid on top. I need to replace the stud walls that where in place on the first floor and my question is it possible to convert the attic and have the new joists supported by the stud wall. 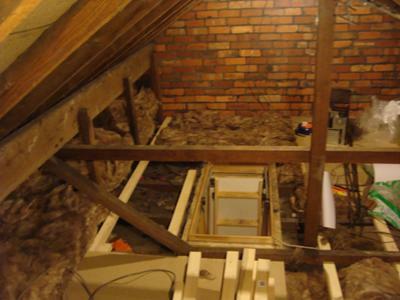 I am going to do a loft conversion and I wanted to know what sort of joists I need and how are they installed? I have an end terrace 1904 house that has 4"x2" cieling joists, which are 8m long and are spaced aprox 14" apart. they are supported on the walls at each end, and on the central load bearing wall. I want to strenghten the joists and floor the entire area to enable storage of a large record collection (quite heavy-15 crates worth)and other tat. I have bought 2.4m 2"x2" battons to add an extra 2" depth to the joists, to add strength. I intended to then lay 8'x2' floor boards onto these. Is it better to screw the additional battens onto the extisting joists along the length of the joists and then lay the floor at right angles to them. With this method the added battens would be just short of the end load bearing walls as the purlins drop onto a 4x2" beam witch sits on the ends of the joists above the load bearing wall, making it impossible to rest the added battens onto the end load bearing walls (-but they would be supported across the central load bearing wall)..
Or is it better to counterbatten the joists by adding the extra 2x2" battens at right angles to the existing joists screwed where they cross over the joists, and supported with mini joist hangers at each end. These would span the 4m width of the roof, but not be supported by any load bearing wall, just mini joist hangers on each end of the battens. Then the floor would be laid at right angles to these and screwed down. Hello there, I am looking to buy a house but needed some help and came across this site. The house has a large loft which is currently not used. The house is a new build and I was wondering whether you knew the weight limits for loft conversions. I would like to create a snooker room, however, the snooker table weights just over 1000kg. Is it out of the question to do this or is it infact possible? I would like to floor my loft for storage. Can I just lay boards on top off the rafters? Someone I work with said these have to be at least 6"x2", but mine our only 4.5"x1.5". If this isn't OK to do, how can I go about it? Also would this be expensive to do? My house was built in the 1930's the loft is approx 15ftx8ft. I am starting to board the floor in our loft and there is what looks like part of an A-frame. I am wanting a solution to remove this and strengthen the roof in the best most possible way. I am about to start work on a loft conversion. My loft is unusual in that the height from the floor to the apex is 18 feet. It is a mid-terrace house. Currently there are two 9 by 3 inch timber biders that go in between the gable walls at approx 8 ft height. I want to have an open feel, therefore I have decided to not put a celing in but to insulate and platerboard all the way to the apex. My question concerns the timber binders. I have been told that these can be replaced with steel rods or straps that will be way more discreet and almost unoticable. Can you tell me where if this is indeed the case and the possible cost of installing two of these, also what diameter they are likely to be to replace the current 9 by 3 timber one. I am making a good storage place in my attic but started as I ment to go on - right. The origanal joist run one way i have constructed a new frame of joists the opposite way at 300mm apart insulated it and then fixed 18mm chip for attic floors. Does this method comply with the building regulations if I was to apply for permission at a later date? I spoke to a builing officer chap today about boarding my loft ...so I can store light goods up there...he's told me I cant board more than 25% of the floor space...is this correct.. ive never heard of this before!!! We were granted planning permission for a loft convertion in our bungalow for two bedrooms, an en-suite bathroom and two dormer windows a couple of years ago. We never proceeded with the project as the building regs needed us to underpin the internal walls to carry the supporting beams as the size of the beams needed if sat on the external walls would have projected through the roof line, and we were not allowed to trim the ends of the beams at an angle. Could you let us know if modern technology has now developed a smaller beam that would carry the same load and allow us to span across the external walls and not progect through the roof line. My mum lives in a 40+ years old house. In the loft there are two cross beams and two angles beams on both sides of the loft all we want to do is move the cross beams higher so we can have better access to the loft would it be possible for me to do this? I have a bungalow built in the 1930's with internal walls that are made from 3 inch breeze block with cement render and finish palster skim to finish as a 4 inch thick wall. I still need to check the foundations to see if they have any on the internal walls. If there is a decent foundation under the 3 inch breeze wall will it support floor joists for a second floor? Where can I get laod bearing capability data for these walls? I have a few questions relating to my terrace. The loft room looks to have been in place for many years. This I guess from the plaster work, which is the old lath and plaster that matches the rest of the house. The floor boards are just on the 2x4's that make up the first floor ceiling. I guess this was done before regs etc. It seems to me that the two stud walls actually prevent a lot of the deflection that would certainly take place if the 4m span on each side of the house were to take the full load of items the attic floor ( I guess this is why the studs are equidistant from each side of the house to the centre lower supporting wall and the attic does not go right into the eaves? ). Therefore, the studs must transfer the load to the lower purlin on each side of the house, where they are nailed to each rafter? I recently re plaster boarded all upper bedrooms due to the cracking original plaster. My main question is about his load obviously getting transfered on to the end of each purlin. One side of the house the wall goes straight down to ground, so no concerns here. The other side is the wall that is centered over the alley, supported by the arch for the dining room chimney stack and about 7 RSJ's that span the alley between mine and my neighbours house, from front to back. I guess these take the load from my purlins, my neighbours purlins, the weight of the wall and I think my neighbours atic is done the same way too. Surprising, since the RSJ's only look about 6cm wide and 15cm high, but then I'm not an expert on RSJ loads! Question 1, Is there any risk of overloading these by putting a load of heavey furniture in the loft? If I were to get a loft conversion today would this wall be used for loading of the new sub-floor? 2 I guess they didnt used to have primer back then as the RSJ's are rusty. Is it a good idea to get these primed up to stop any corrosion? I have been told to get steel girders in to convert my loft safely. But with the angle of my roof I can't do that, and I don't need that much space. Can I just add in joists to the smaller joists , add a wall down and then put in seperate joists over the ceiling to support all together. So a row of uprights on the sides and two rows above the ceiling - along with several beams, to join two sides together? wouldn't that do the job? I'm doing loft coversion for storage can you move the joists spanning across the timber roof can you raise these any higher so you can stand up? Hi. I have reviewed the trada span table to acertain new joist sizes for the loft. Whilst the info points towards a 170x75mm to do the job, do you know of any other strength class timber that would be less than 170mm and perhaps span further? We are considering changing our loft to an occasional room. Our joists are 6x2 and over 400mm apart,our builders suggested putting in noggins rather than doubling up the beams,would this be enough? About ten years ago I floored and lined the loft for storage only. I am now selling and applied for a letter of comfort from the council. They have given me 2 options either rip it out or have remedials done which include roof vents-insulation with a plastic membrane and a report from a structural engineer. Are all the remedials necessary as rhe space is only used for storage?. We are doing a loft conversion into our 1930's built house, to give us another bedroom. We have 3 steel columns installed (1x 203x203x46 and 2x 152x152x37)but just had the council inspectors visit and he's not happy with the fact that the middle 152x152x37 column is about 10cm outside the chimney stack. Though our engineer advised that the loading on this column is not a problem , the inspector wants us to move the column as this is too close to the chimney (previously agreed that as long as it doesn't touch the chimney would be ok)(Note that the actual beam arrangement is the only one to accomodate staircase). The size of the new room is 25 square meters and we already have the 3 columns; I'm not an expert but putting on another steel column to sustain end of the 3 existing columns won't be far to heavy for walls? Would you please be able to advise, is there a regulation to say that the steel cannot go close to the chimney stack - please note that the chimney has been removed years ago and nothing is left out of it. I have boarded out my loft the joists were originaly 6" x 2 1/2" but have been increased to 8" x 2 1/2" to increase strength and to level them up with 18 mm chipboard flooring ( 2400 x 600 )on top - all above glued and screwed ,glass fibre insulation has been fitted between the joists. The rafters are 5" x 2" with 3" kingspan insulation between with 1" insulation across with 9.5mm plasterboard to finish. at each eave new stud walls have been constructed 1/3 of the way in (from centre of house to eave) made up from 4" x 2" doubled up at sole and head with uprights at 16" centres. The original plan was to use this space for a storage/ play room ( ie soft seats, games consoles etc ) with a pull down loft ladder but i may need the space to be a living room as a less able relative may have to move in and use the original living room as a bedroom. I am a qulified joiner hence the work already done what i cannot seem to find out is if i install a staircase , velux windows, escape ladder, mains fire alarm and a firedoor at the bottom of the stairs would all this be enough to comply with building regs or do they only relate to the conversion of space for bedrooms and bathrooms which i do not want to put up there. Your advice on this would be much apreciated. I am wanting to remove a center wall in my house to open up a space. The wall supports the ceiling joists comming from each end of the house. I have a four sided hipped roof with no supports on the center of the roof to the wall I want to remove. 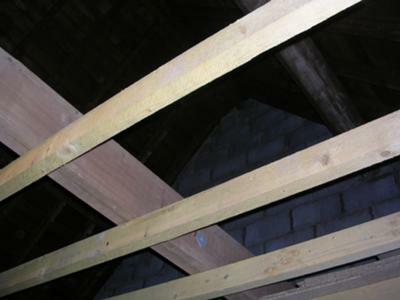 Can I support the center of the ceiling by attaching the ceiling joists to the roof joists? Hi, I can find the specification of single timber joists and their respective clear span / timber grade - where do I or can I find the same sort of detail that will tell me how far a double or triple 4x2 c16 timber joist will clearly span? I am looking to creat a little more space in my loft. My house has the traditional design beams as in the diagram on this site, not the W formation. My question is from the purlins (I know what the purlins are) in two places are 4 diagonal beams (2 on each side) at right angles to the rafters / purlin that meet in the centre of the loft on a load bearing wall. These are clearly load bearing. However running accross the loft - (not along the purlins) from one side to the other (rafter to rafter)are two 3 x 2 horizontal beams. I have been told that they were used as spacers when the house was built and were just left there and serve no purpose and certainly appear not to do anything.. Can these be removed, or just one at least?? I have also considered installing equivalent beams closer to the pitch to provide extra strength if this beam was removed. Just to complete the picture from the point where the diagonal beam meets the purlin & rafter the is also a verticle beam at all four points that joins to the ceiling beams and I can see these serve the purpose of providing extra support to the ceiling beams. I am not asking to remove the purlin, diagonal beam or verticle beams - just the cross beam. 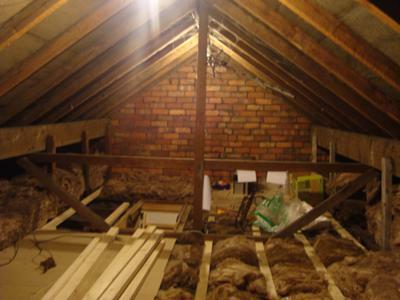 Even the image on this site about a traditional loft space dose NOT have the beams I am asking about. I hope this makes sense. Any advise would be gratefully received. I own an Edwardian semi and the ceiling joists ran from the front to the rear of the property, but were not attached to the roof rafters. These joists have been removed, to make way for the new floor joists for the loft conversion. The problem is the house over the 104 years has settled, leaving a 200mm difference in the height of the existing wallplates (from the front wall to the rear wall). 1) Install joist hangers, nailing to the existing timber wall plate and also screwing into the wall? Therefore allowing the levels to be changed at each joist location? 2) To install steel UB's and sit the new joists on the web. 3) To install the floor joists perpendicular to the previous ceiling joists, i.e. from party wall to gable end! Is this permissible within regs? 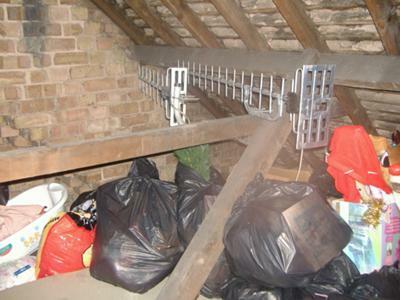 Using strong galvernised joist hangers? Only problem is to level these, would ultimately mean the majority wouldnt sit at an appropiate level to chase out mortar!! I wonder if you could tell me the size of timber is needed for my floor joists for my loft conversion. At the moment they are 4" by 2" ,with a span of 25 ft but there is a load bearing wall though the middle of them. I'd like to use my loft for storage. It's a typical mid-terrace rafter and purlin design with four 4x2 angled struts running off a binder and four 4x2 tie beams. I've already laid a tongue & groove chipboard floor but looking at your site wonder if I should possibly take this up and add a 2nd set of thicker floor joists for strength. However, the 9x3 binder runs down the middle, so my question is how would I add in new joists, if they are taller than 4 inches they won't fit under the existing binder? I'm thinkin about laying a new floor in the loft so that it can be fully load bearing and comply with building regs. The house is a 1930's semi Purlin & rafter loft with purlin's holding the roof rafters up and purlins/binders below them in the eaves holding the joists together. These lower purlins are effectively sat on a total of 5 supporting walls (between mine and the neighbour). Will I be able to use joist hangers on these lower purlins to support new joist between them? If not I assume I will need some sort of steel beam to run alongside these lower purlins instead....how would a builder normally get these in the loft? What rough sort of cost could I expect? We have permssion to convert our terrace house loft into a bedroom/en suite totalling some 20 ish sq.m. We also have permission to use TJI joists as per engineer's doc. What I would like to know, please: as jji-joists/TJI joists can apparently be inserted by removing two or three rows of roof tiles, (avoiding *RSJ's and party wall permissions, etc), what actually would then support the vertical rafters which replace the current "w" rafters? Also, do *steels still have to be used to brace and strengthen the upper roof to replace the work done by the "w" rafters? Apart from the jji-intelli-roof (amazing!) process, what part do jji-joists/TJI joists actually play in loft conversion where it seems *conventional methods must still be used? I sent an email to James Jones of jji-joists asking these questions, but no reply to date. Hi have noticed that there is a crack in one of the beams running on a 45 degree from my front purlin down to the central beam. It looks like the wood has cracked at the point of a knot but has not broken in two. Is it possible to brace with a metal strap screwed to either side (if so what could I use and where could I purchase one from?) or is there an alternative remedy. The loft is boarded and sees occassional traffic but is not professionally converted. Please can you advise. Hi ! 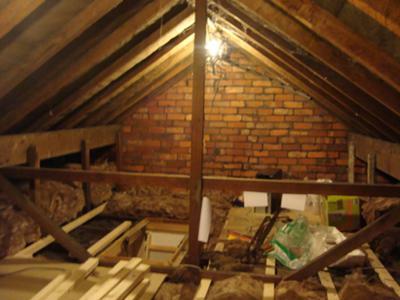 We have recently moved into a bungalow and were planning to convert the attic but have found out that we need to strengthen the floor and put in stronger supporting beams/joists. The flooring space is approximately 7m x 7m - how much should this cost to have it done for us and is this something we could do ourselves ?